Coming in with three conference championships in the past four years, Ohio State could not overcome Penn State in the Big Ten Wrestling Championships this weekend, finishing second with a 122.5 team score behind the Nittany Lions’ 157. But Ohio State had nine wrestlers earn automatic bids to the NCAA Tournament, recording two individual championships. Myles Martin, the 184-pound senior who came in with an undefeated record and the No. 1 seed in the weight class, continued that streak. 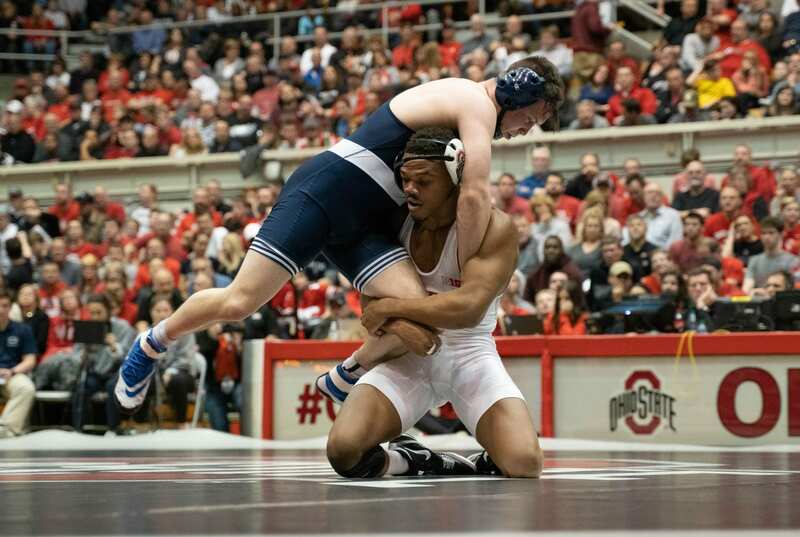 Seventh-ranked Penn State senior Shakur Rasheed took a medical forfeit in the match, giving Martin his first Big Ten championship. Ohio State senior Joey McKenna, No. 3 at 141, earned his fourth conference championship, defeating Nebraska sophomore Chad Red in a 9-2 victory. Earning Pac-12 titles in his freshman and sophomore season at Stanford, McKenna earned his second Big Ten championship at 141. In the Big Ten title bout at 149, Ohio State redshirt senior Micah Jordan did not find as much success, falling to Rutgers redshirt senior Anthony Ashnault, who came in with an undefeated record as the No. 1 seed, in an 8-6 decision. Redshirt junior Kollin Moore also came up short in his rematch with Penn State’s Bo Nickal in the 197-pound championship, losing 10-3 as the Nittany Lions’ senior recorded 2:51 in riding time. Ohio State junior Like Pletcher also fell in the title match at 133, losing to Rutgers junior Nick Suriano in a 4-1 decision. Ohio State freshman Malik Heinselman earned the chance to compete in the NCAA Championships with a 8-5 win against Wisconsin sophomore Ethan Rotondo. The first session of the NCAA Championships begin on March 21 at noon in Pittsburgh.